Reset service light indicator Audi A4, from years: 1994, 1995, 1996, 1997, 1998, 1999, 2000, 2001. If the service is due on these vehicles, when the key is turned to position 2 one of the dashboard displays will show. Service INSP, INSP1 or INSP2 for Fixed interval services. And, SERVICE OEL or OIL, for the Oil Service interval. The oil service reset procedure is as follows. Start with the ignition turned OFF Press and hold the button on the right side of the display while turning the ignition on (position 2). Service OEL / OIL, should be displayed. Release the button on the right Pull out the button on the left side of the display until the service prompt is cleared. The display should now read ,—, . Release the button on the left then to access and reset the service information. Push the button on the right briefly Service INSP, should show on the dash. Pull out the button on the left side of the display until the service prompt is cleared. Release the button on the left. Reset service light indicator Audi A4, from years: 2001, 2002, 2003, 2004, 2005, 2006, 2007. Below and to the right of the speedometer are three buttons the right hand button of these three is usually labelled 0,0. And the centre button labelled with a spanner/wrench symbol. Start with the key in, but the ignition turned OFF Press and hold the Spanner button, while turning the ignition on (position 2). Release the Spanner button SERVICE should now appear on the display. Press and hold the 0,0 button until the display shows SERVICE IN xxxx Miles / Kilometres Release. The 0,0 button, then turn off the ignition. That it is the full procedure how to reset service light indicator Audi A4. If you like to reset any maintenance oil light after an oil change. Or reset check engine light, airbag light, inspection key or insp errors when maint reqd, for Audi cars. Or any error which appears on the display. Write in the search box the car name for which you want to find information, and find how to reset other service reminders when by yourself. I WOULD LIKE TO KNOW HOW TO RESET MY SERVICE LIGHT ON MY 2012 AUDI A6. I WOULD LIKE TO KNOW HOW TO RESET THE SERVICE ON MY AUDI A4. THE PREVIOUS POST WITH THE A6 IS INCORRECT. Your Audi is very new, still do not know exactly how to reset service light but you can try this procedure. Your Audi dealer resets the display after each service. You can only reset the oil change display yourself. To do this, select function selector button > Service interval display > Reset oil change interval. The next oil change will be indicated as being due 15,000 km or one year (fixed service interval) after the oil hange interval is reset. is there any way i can turn off the air bag light on my 2001 A4 Audi? Hello Michael Olsen, if the car suffered an accident and because it the airbag light is on, you can disconect the yellow connector situated under the front driver seat. Or you can turn off on your Audi A4 airbag check light with a VagCom Device. Attention if the airbag light in your car is on without having an accident the airbag light is on beacause does not work. Take extra care and go to an Audi A4 authorized service. How do you reset the service light on 2012 Audi A4? Thanks! Please tell me what service light do you whant to reset on your 2012 Audi A4 ? You tried the procedure how to reset service indicator for Audi A6 from 1996, I know that Audi A6 C4 was made ​​between the years 1994 – 1997. I replaced some gauge bulbs in my son’s 97 A4 and now have black odometer screen. Any help? Check fuses in the electrical panel. I drive A4 2006 model, my hazards are not working, when I put on lights at night, there is a funny noise made by the car. Hello Kusta mabe your hazards have a blown fuse. Try tu change the hazards and see if your light will work. How do I reset my service light on an audi a4 2010? On your multifunction display go to settings and scroll down to SERVICE and then push ok. The reset is there. You cant see it at first because it is on the second page of menu items. Just keep scrolling down and you will see. 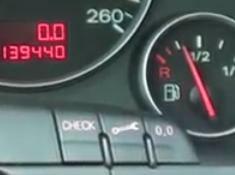 I have an Audi A4 2006 TDi, it was recently serviced, since the service the oil warning light has stayed on (even though oil level & pressure OK) I have tried the reset procedure shown on this website which works for about 10 miles and then the warning light comes back on, can anyone tell me how to clear the fault. Sound like it might be a faulty sensor? This is the correct procedure how to reset service oil light on your Audi A4 B7. I do not know what is the cause that the warning light has recurred after you reset. Please describe to me how it looks the oil service light what color is red or yellow, and in what place appears. It might be another indicator much worse than the service. I have 2008 audi a5, is it posiible to remove service due light? Try this, turn the engine on without starting the engine, accest the menu, select CAR SYSTEM, then select service & check, after that select service interval, reset service interval and select yes. Hi there I have an audi a4 b7 2.0 tdi sline se 2008. I got my turbo replaced and with that an oil change service only and wanted to reset the service cluster to reset back. The audi specialist used the fault reader device to reset it but instead it deleted it completely, so now each time I press the service button I just —— with no count own or duration before next service as before. I have tried the procedures on some websites but hasn’t made any difference can you help. Also I am now getting yellow minimum oil light warning on my display and not sure what it is. Any assistance will be good. Hello Vik, hard to say if you can change the service time with dash board buttons on your Audi A4 B7. Why you don’t go back on that service and ask him to resolve your problem. If you getting yellow minimum oil light indicator on your monitor check the dipstick to make sure you do not have problems with the engine oil. All I can say is that if the warning light is yellow the error is not so bad and you can drive your car on a service. If the warning light is red should stop the engine immediately and take the car on a platform to a service. Hi Admin thanks for your reply, right I did not go to Audi directly as I then found an Audi and Porsche specialist to replace my turbo for a new one and at the same time do an oil service change my oil, was way cheaper especially being in Europe. I am working I’m Stockholm Sweden and not back in the UK till late September. I did take it back to the service person and they only had 2 options to reset or delete this and he reset it but now in my display is only shows dashes and he’ s now sorry that he can’t do anything else. It was frustrating for him not able to fix the issue, could I take it to Audi to programme it? Also how would one know if the car has a balance shift or not as I am doing a lot of reading that cars without should be ok others not. I am hoping it’s something minor or least just sensor. As before I thought it was due to my turbo why it drinks a lot of engine oil but after it be oil serviced last week, yesterday I get the yellow warning light. If he pays for it I think that it is best and go to Audi. Hello Vik, last time i forgat to introduce myself, my name is Ovidiu, please tell me what engine do you have on your car: engine capacity, type of fuel diesel/petrol and horse power? Have an Audi A4 avante 2001 model vehicle ident no WAUZZZ8DZ1A*****,TYPE8D5 OC8,ENG CODE APT—-EPT and A4 Avant 1.8 92kw. My service light is on how do you reset it? And my car stereo is not coming on where can i find the fuse for the stereo i have tried to check on the drivers side where others are located but cant find it. Please tell us what procedure did you try? Hi there, I can’t reset the service due indicator on my A4 2009 1.8 tfsi. I can access only the oil service indicator and reset it. I think that you have an Audi A4 B8 this procedure is for Audi A4 B7. Ive tried this a few times, as soon as i put the car into drive the service indicator comes back on. Please tell more about your car. You have an Audi A4 B7 follor our procedure “Reset service light indicator Audi A4, from years: 2001-2007” and you will succeed. Hello Stefan, after you reset the warning light this will appear by himself after 10.000 km or 15.000 depends on what interval the car is set. Thanks u guys for you help me. Hello Stacy, can you tell me what reason for this warning light? You can stop in several ways, but i need to know why is on. I have an Audi A4 2008. How to I reset the service required light. Looks like a circle. Hello David, please tell me if your car is Audi A4 B7 or B8 , if is possible please tell me the engine capacity and tip.